Connect a VGA-equipped display through USB 3.0, while keeping the USB 3.0 port available. The USB32VGAEH USB 3.0 to VGA Adapter is TAA compliant and turns a USB 3.0 port into a VGA output port with 1920x1200 (WUXGA) video support. The adapter features built-in USB 3.0 pass-through, which offers a connection port in place of the USB port used for connecting the VGA adapter - an ideal workaround for Ultrabook or laptop users where only a limited number of USB ports are available.Functioning as an external graphics card, this USB to VGA adapter provides a convenient way to add multi-monitor capability to a USB 3.0-enabled desktop or laptop computer (optimal performance from USB 3.0, backward compatible with USB 2.0).Leveraging the high-bandwidth (5 Gbps) SuperSpeed USB 3.0 interface, the adapter delivers smooth, high-definition content to your VGA display / projector. The adapter can be used to mirror your primary desktop, showing the same image on each display, or to extend your desktop to double your workspace and increase your productivity. 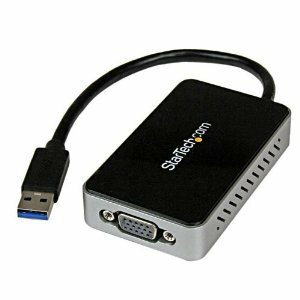 Connect a VGA Display through an available USB 3.0 port to enjoy multiple monitor efficiency. The adapter features a Built-in USB 3.0 pass-through hub that replaces the USB 3.0 port used to connect the adapter - an ideal workaround for Ultrabook or laptop users with a limited number of USB ports.The USB32VGAHEH external video card uses USB 3.0 transfer speeds making it ideal for many applications including HD video playback.